The U.S.-Russia Business Council’s members comprise nearly 170 companies, both large and small. As the nation’s premier trade organization devoted to promoting the commercial relationship between the U.S. and Russia, the USRBC works with a broad coalition of members to advance overall commercial relations between the two countries. Companies join the Council for a host of reasons, ranging from business development and government access to networking and dispute resolution support. For over 20 years, the U.S.-Russia Business Council has worked closely with the U.S. and Russian business and political communities, forging relationships and building experience that bring tangible value to our individual members while simultaneously serving to expand and enhance the U.S.-Russian commercial relationship. The USRBC Daily Update , which briefly summarizes and analyzes the most important U.S.-Russia-related commercial news of the day in a fast-changing environment. A recently re-designed full-service interactive web site where members enjoy instant access to a wide range of U.S. and Russia-related bilateral commercial information. The website features searchable archives of the USRBC Daily Updates and Sectoral News , a searchable Membership Directory , a USRBC Events Calendar , event registration and membership renewal tools and other useful information. A detailed print membership directory that promotes peer-to-peer networking. USRBC hosts major conferences and small roundtable discussions that highlight member interests and provide practical value, providing access to top government decision makers from both countries and excellent networking opportunities. 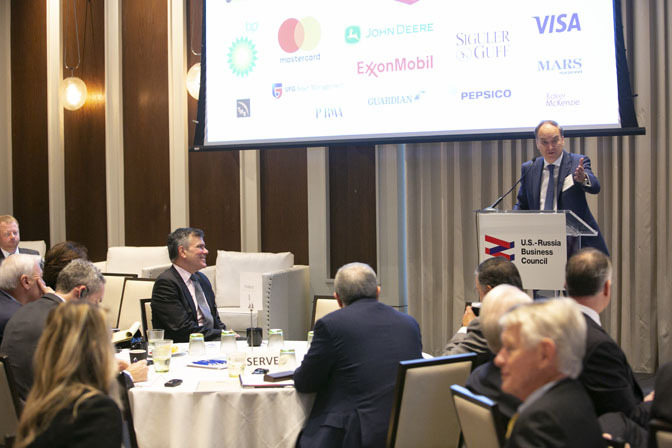 USRBC’s Annual Meeting is well attended by senior corporate executives and regularly features Cabinet-level officials and leading figures from the private, public and non-profit sectors. It’s a must-do event covering top issues on the U.S.-Russia commercial agenda. USRBC’s policy briefings and special events allow for in-depth discussions on specific sectors and themes in an intimate setting with key policymakers. Roundtables with outside U.S. and Russian experts on topics relevant to members. USRBC leverages strong relationships with prominent members of the legislative and executive branches of both governments to influence initiatives and policies pertaining to foreign investment, market access, and other issues. USRBC also plays a vital role in forging public-private dialogues that make tangible contributions to U.S.-Russian commercial relations. USRBC regularly provides the U.S. and Russian governments with private sector input on policy issues through briefings prior to summit meetings, major official visits, regular meetings with key government staff, and in responses to requests for public comment. USRBC also provides platforms for members at different membership levels to have direct access to key U.S. Administration officials through our monthly meetings with State Department officials and in quarterly meetings with Russia’s Ambassador and officials from the National Security Council. USRBC takes on broad-based commercial initiatives – such as keeping members abreast of developments regarding the Eurasian Economic Union --as well as sector-specific advocacy or advocacy on behalf of individual companies to promote their business agendas in the United States or Russia. USRBC has established itself as the “go-to” organization on leading bilateral commercial initiatives. During the Ukraine crisis, USRBC has been an essential source on understanding the U.S. government approach to sanctions against Russia. Historically, we were instrumental as a private sector interlocutor with the Bilateral Presidential Commission (BPC), serving in an advisory role to many of the BPC’s working groups. USRBC also spearheaded the formation of and led the Coalition for U.S.-Russia Trade, which advocated for a meaningful agreement on Russia’s WTO accession and successfully secured permanent normal trade relations (PNTR) with Russia.